Before the question can even be asked, Freddie Freeman has flipped it around. You want to ask how he stayed loyal to the Atlanta Braves, through the trades of so many talented friends and the pain of three consecutive 90-plus-loss seasons. He wants to talk about how the Braves stayed loyal to him. You want to know if he even thought about leaving. He wants to tell you how thrilled he was they wanted him to stay. "How I view it is, the Braves drafted me when I was 17 years old, they gave me an opportunity in the big leagues when I was 20 and gave me a contract when I was 24," Freeman said. "In all reality, I owe everything to the Braves." Before long, he has you convinced. Before long, you're wondering why you ever wanted to ask if he ever thought about leaving in the first place, because the idea of Freddie Freeman wearing a different uniform has stopped making any sense at all. "Freddie's a Brave," manager Brian Snitker said. And that means 2018 has been a very good year for him. For much of the first half of the season, the Braves were a surprising first-placed team in the National League East. In 21-year-old second baseman Ozzie Albies, they have the youngest player in the All-Star Game. They have an even younger up-and-coming star in 20-year-old Ronald Acuna Jr.
And underpinning it all, they have the National League All-Star first baseman, the 28-year-old who got more votes than anyone in the NL, the guy who has topped many midseason lists as the NL's Most Valuable Player. That would be Freddie Freeman, who may also qualify as the Braves' biggest fan. "There is nobody that is more excited that the Atlanta Braves are winning than Freddie Freeman," said Paul Byrd, the former major league pitcher who does pre- and postgame interviews for Fox Sports South. "I would agree with that," Freeman said. "The last couple of years, there's no sugarcoating, it's been tough. It really has." And that's about as close as Freeman will ever come to complaining about it. Before it was tough, before Atlanta averaged 90 losses from 2014-17, playing for the Braves meant learning how to win. When a 20-year-old Freeman showed up at Turner Field to make his big league debut on Sept. 1, 2010, the Braves were 77-55, in first place in the NL East and tied with the Cincinnati Reds for the league's best record. They were headed for 91 wins and a spot in the playoffs. It was the 18th time in 20 years the Braves had finished above .500 and the 15th time in those 20 years they'd been to the postseason. Chipper Jones and Brian McCann were on that team. Tim Hudson and Derek Lowe were in the rotation. Bobby Cox was still the manager, in the final season of his Hall of Fame career. Freeman had just 24 plate appearances in that first call-up, batted .167 and wasn't on the postseason roster, but he watched and learned what it was to be a major leaguer. He also learned what it was to be a Brave at a time when being a Brave meant playing the game the right way and usually winning. A year later, Freeman finished second in the Rookie of the Year vote, but the Braves collapsed in September, going 9-18 and losing their final five games to miss the playoffs by a single game. As discombobulating as that was, the Braves followed it up with 94- and 96-win seasons, making it 17 playoff appearances in a 23-year span. In 2013, Freeman made his first All-Star team and finished fifth in MVP voting. The Braves lost a playoff series to the Los Angeles Dodgers—a defeat most remembered for how then-manager Fredi Gonzalez left Craig Kimbrel unused in the bullpen as David Carpenter lost the decisive game in the eighth inning—but there was no reason to think an era was ending. Freeman was 24. So were Jason Heyward and Andrelton Simmons. Justin Upton was 26. Kimbrel was 25. Julio Teheran, already a top-tier starting pitcher, was 22. And just before spring training 2014, when the Braves offered Freeman an eight-year, $135 million contract—at the time, the biggest contract in franchise history—he eagerly accepted. "We worked at extending what we thought was the core, to keep this young, dynamic team together," said Frank Wren, who was the Braves general manager at the time. "We had a very good team." They also had a budget, and while the Braves extended Freeman, Kimbrel, Teheran and Simmons, they did not agree to new deals with Heyward or Upton. Within 22 months, Kimbrel, Simmons, Heyward and Upton would all be gone. So would Wren, fired as general manager with a week to go in the 2014 season, less than eight months after Freeman signed his contract. Former longtime front office executive John Hart left the MLB Network studios and took over as the head of baseball operations. It wasn't long before he realized the upper levels of the farm system were barren and the payroll wouldn't work, and the Braves needed to go into full rebuilding mode. Everyone and anyone of value could be traded. Hart came to believe the same thing Wren did, that Freeman was indispensable. He also learned about Freeman's character, which showed up the day the Braves signed him to the extension. "He was extremely appreciative and loyal to the organization when we gave him that contract," said Wren, now the senior vice president/player personnel of the Boston Red Sox. "He was as appreciative a young player as I've seen." When Freeman signed his deal in February 2014, he had three years of major league service time and was arbitration-eligible for the first time in his career. It was the point when a player could expect a long-term contract offer and the question would be whether to sign or to wait it out for bigger riches in free agency. Freeman was just happy the Braves trusted him enough to offer him all that money. "Four years later, I'm still kind of at a loss for words," he said. "I never, ever thought any of this would happen. I grew up playing a game I loved and grew up playing with my brothers and my dad. Next thing you know, I'm here. Believe me, I didn't expect any of this." No one who knows Freeman is surprised to hear him say this. And everyone who knows him is certain he means it. That's one reason Hart and the people who came in to run the Braves believed he was the one guy who would stay, the guy they could keep through the rebuilding and into the better years to come, the guy who would be able to handle all of it. "Freddie was going to be the cornerstone piece," said Hart, who left the Braves last November. So as they traded Heyward to St. Louis and Kimbrel and Upton to San Diego and Simmons to the Los Angeles Angels and Evan Gattis to Houston and Shelby Miller to Arizona, Freeman remained through 2015 (95 losses), 2016 (93 losses) and 2017 (90 losses). "I cannot make it any more clear: We are not trading Freddie Freeman," former general manager John Coppolella told Bob Nightengale of USA Today in November 2015, right after the Simmons trade. "We are not. I'd give my right arm before we trade Freddie Freeman. It is not happening." Reading those words at home in Atlanta, Freeman loved it. He couldn't believe a general manager would say something like that. He was even more impressed when Coppolella picked up the phone and called him directly to say the same thing. "I didn't want to leave—ever," Freeman said. "I still don't." It wasn't easy watching friends leave, going to spring training with a team everyone knew couldn't win. It wasn't easy when Freeman got off to an MVP-type start last year, only to have his left wrist fractured on May 17 when Toronto's Aaron Loup hit him with a pitch. He was leading the National League in home runs at the time, with 14 in 37 games, the most of any Brave that early in a season since Hank Aaron. He was hitting .341 with a .461 on-base percentage and .748 slugging percentage. "I thought for sure he was going to win the MVP," Braves pitcher Mike Foltynewicz said. The doctors said he would miss at least 10 weeks. Freeman told them he was a fast healer and vowed to do anything he could to return quicker. He came back on July 4, one day less than seven weeks after the injury. Oh, and he came back as a third baseman. Ask Braves players and coaches, and Freeman's brief move to third base is often the first thing they bring up. It wasn't just that an All-Star first baseman agreed to play third. It was that he offered to do it without ever being asked, because the Braves had traded for first baseman Matt Adams while he was hurt, and while Adams was hitting well, third base was more of a problem. "He was the one who made the suggestion," said Ron Washington, who coaches the Braves infielders. "And he handled himself immaculately." Freeman shrugs it off. He signed out of high school as a third baseman, he reminds you. So what if his entire pro experience at third before last year was five games in rookie ball in 2007. He was helping the team, and he was helping Adams. In fact, Freeman now says the one good thing about getting hurt was that it helped Adams jump-start his career. "What a great guy he is," Freeman said. "He needed an opportunity. I always look at the positive in things. Matt Adams is a beautiful human being. With the bad that happened to me in breaking my wrist, the good happened to him in getting an opportunity." It would be easy for Freeman to play the hero now, to say how great it is to play for the Braves. They're a half game out of first in the NL East and have such a surplus of young talent that it's not hard to see them contending for many seasons ahead. Freeman, however, never wavered in saying how much he wanted to play for the Braves through all the losing. He said it last winter, after four straight years of losing, when Fox Sports South interviewed him at the Braves' Chop Fest. He brought up Chipper Jones, who played 19 seasons with the Braves and never put on another uniform, and who is going into the Hall of Fame this month. "Chipper is the Braves," Freeman said. "Never wanted to be a free agent. He was loyal. That rubs off on me. I want to be here forever. So hopefully I can follow in his path. I don't know if I'll ever do what he did, but hopefully I can be here for the rest of my career." Jones was also part of six teams that won at least 100 games—and only one team that lost as many as 90. "Chipper was fortunate enough he got here at the right time," Snitker said. "He had good timing." Snitker is as much a Brave as Freeman. He signed with the team in 1977 as an undrafted free agent out of the University of New Orleans and played four seasons in the minor leagues before turning to coaching and managing. He's been with the organization ever since, and he was Cox's third base coach when Freeman debuted in the big leagues in 2010. "Snit cares more about the person than the player," Freeman said. 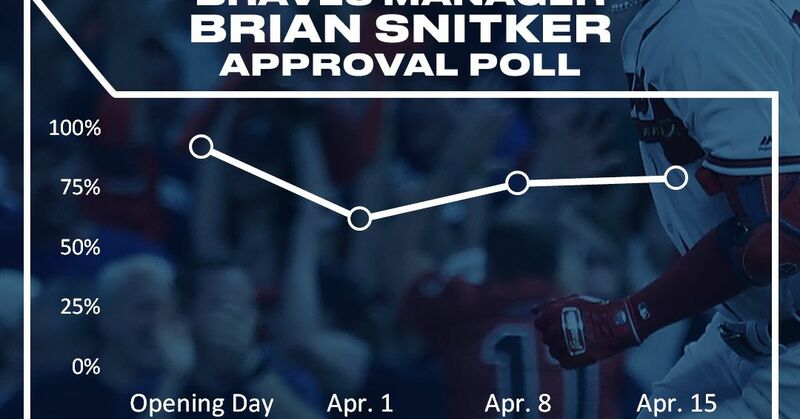 "You respect the man Brian Snitker is. He deserves a World Series ring." Many would say the same about Freeman. Life is good for Freddie Freeman now. He's happily married, his son Charlie is nearly two years old and he's already picking up anything that looks like a baseball bat and swinging it. On the field, Freddie is playing well and his team is winning. And he doesn't even have to fight Atlanta's notorious traffic to get to the ballpark each day. The Braves moved to SunTrust Park before the 2017 season, and in preparation for the switch from Turner Field, Freeman moved, too. He had lived in Atlanta year-round since 2011, even though his family in California would prefer to have him closer to home in the winter. But the new park is in Cobb County, on the north side of town, and Freeman wanted to be a little closer. "It's 13 minutes, all on back roads," he said. He loves the new park and the development around it. He praised first-year general manager Alex Anthopoulos for improving and enlarging the room where players' families wait after games. He's proud that when he sees opposing players at first base, they all tell him they view Atlanta as a great place to play. Just as Freeman has always believed. He admits there were times during the year everyone else got traded that he didn't understand why it had to happen. But he says he came to believe it was the right thing for the organization, even though it hurt him to lose close friends, as well as talented teammates. He told ESPN.com's Jerry Crasnick last year that the Heyward trade was the toughest to take. But ask him now about the friends who left, and Freeman has a different outlook. "You never know," he said. "They might come back." You never know. The Braves could use a top closer. Kimbrel will be a free agent this winter. They might come back, and they might love it. But they won't be able to appreciate it the way Freeman does. He was the one chosen to stay. Now he's the one who can appreciate the Braves' success most of all.